Another tasty recipe from Bute Island. Drizzle this vegan dressing over jacket potatoes or a spring salad of baby leaves. Blend all the ingredients until you get a smooth mix, and reach the consistency you'd prefer for your dressing. So you might find that you need to add a little more soya milk, depending on what consistency you like. 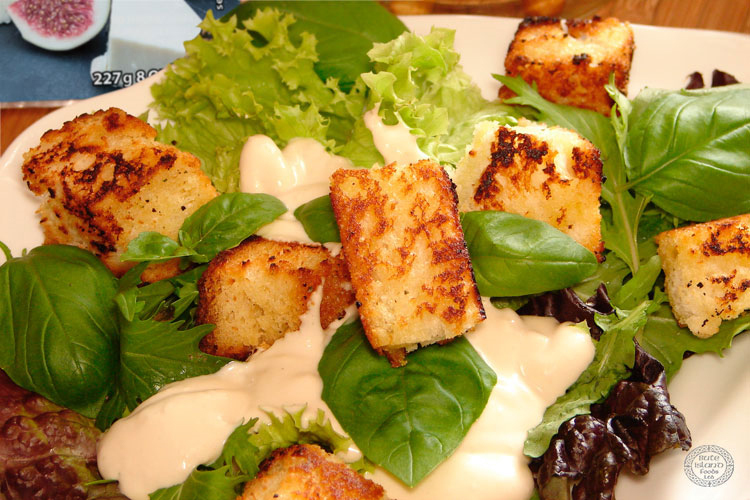 Pour the Blue Sheese dressing over a mixed green salad with big rustic croutons. Garnish with the toasted pine nuts and some fresh basil. Alternatively, you can pour over a jacket potato, or mix through some freshly cooked pasta. Finally, this dressing will also serve as a tasty dip for tortillas, sliced vegetables (like celery and baby carrots) or crisps. Cut two slices of nice soft rustic bread which has plenty of air in it. Marge the bread both sides with a nice Vegan margarine, and cut into big, generous crouton squares. Heat up a frying pan with a little olive oil in for frying. Fry the bread gently, turning as each side becomes golden brown. You might need to drizzle some more olive oil from time to time. Once the croutons are almost done, grind some pizza seasoning over them.